Maura Gallager spent Saturday -- Record Store Day -- stalking new finds at the Inner Groove Records in her hometown of Collingswood, New Jersey, home of two stores with lots of vinyl. The appeal of vinyl for Inner Groove Records' owner is simple: Better. “Better artwork. Better sound,” said Dave Frankel, who had a line waiting for him when he opened up his Collingswood, South Jersey store on Saturday for Record Store Day. “We had a line for the limited releases special releases. They’ll be gone after today,” he said. “And on eBay for double tomorrow,” said one of his customers, eliciting a wink and a nod from Frankel, busily ringing up sales. 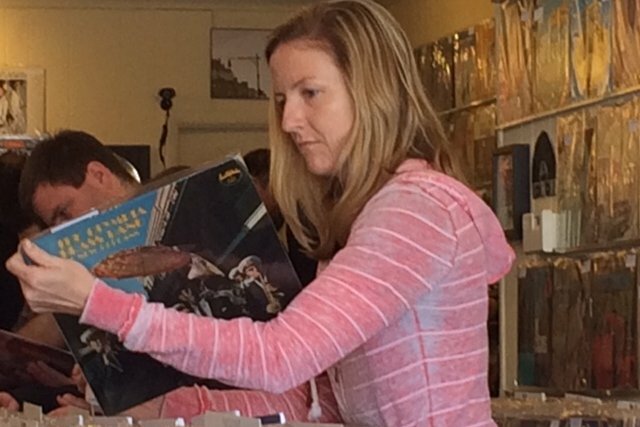 For Collingswood residents Marilyn Candeloro, 32, and Maura Gallagher, 31, vinyl and Record Store Day is about connecting. For Candeloro, vice president of Dock Street Brewery and a founding partner of Dock Street Spirits, it’s a connection to a father who died when she was just three-years-old. “I never did like that music,” she said of the sound of her own generation, emphasized with a disdainful nose wrinkle. “I found a lot of records," when going through her father's belongings. "They were all signed ‘Joe,’ my dad’s name. “I heard stories about him. I admired him. He liked music. I like music. I still love the ‘70’s sound. There’s a free spirit and an authentic sound. "And then there were like 30 Herb Alpert albums, which are funny,” said Candeloro of the bright and bouncy sounds of the Tijuana Brass, Albert's group. She likes that albums force her to listen more completely than a download. “When you put on an album, you are forced to hear new songs. And it creates more of an atmosphere. “It’s become kind of an addiction,” she confesses, having just bought a David Bowie album for $25 and The Pretenders for $8. “I’m ashamed to admit I didn’t have any Bowie,” she added. Gallagher, who works in marketing and event promotion, likes the physical connection to an album, the images on the covers and the customer service that comes with a knowledgeable owner like Frankel and his staff. “I’m a genre shopper, mostly blues and jazz,” adding her current likes are anything by Nina Simone and a digression into California surf music. "I think that's seasonal," she laughed, sitting in a splash of spring sunshine outside the record store. Neither are intrigued by the limited release albums featured on Record Store Day. “We like keeping it simple,” said Candeloro. A few blocks away at Collingswood Music, which is part performance venue, part guitar store and part record store, Rob Ivone, 37, was pondering several Rolling Stones albums, looking for the most pristine vinyl of two different albums. The Collingswood resident said he came out especially for Record Store Day, in order to support a local store.